this is such a simple outfit, but one of my favourites. 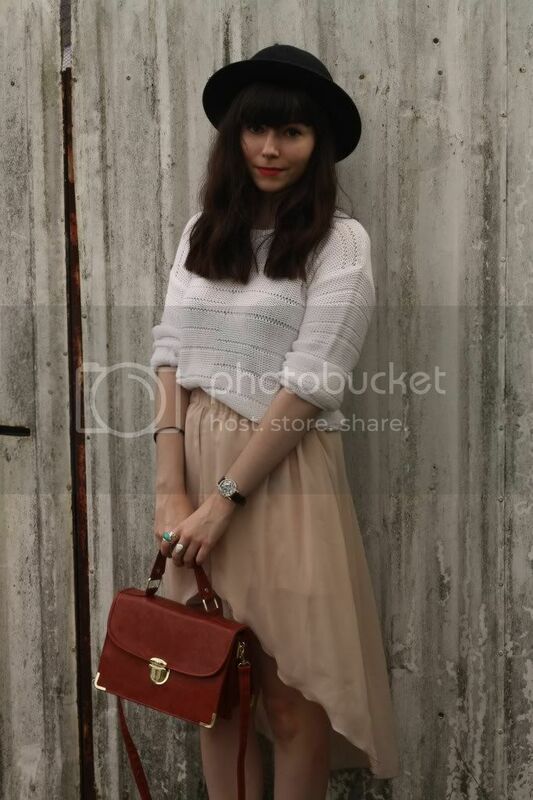 i'd been waiting to wear this jumper with this skirt, it's such an easy pairing and i love the two colours together. burgundy jeans/trousers, classic leather jacket, kimono jacket, leather skirt, chunky jumpers, patent loafers and some comfortable wedges. That skirt is such a beautiful shape and the pale colour is so flattering. I'm after some burgundy jeans however I never, ever wear jeans! So getting a pair seems a little daunting! So ready for fall! That skirt is a true beauty, from the color, to the silhouette. The jumper and skirt work so well together!! LOVE this outfit!! Very cute, gentle, and feminine! skirt is really lovely! The colour is cute. Such a pretty effortless-looking outfit. I love that the skirt is a midi and mini combined :) I really need to do out a similar very exact shopping list to whip my random wardrobe into shape! I can't decide which I like more your satchel or the gorgeous skirt you're wearing. The tiered hemline is breathtaking and the material gives the impression that you're floating. This year for fall/winter I'm investing in good pairs of tights, I'm hoping to be able to score some good black, chocolate brown and mustard yellow tights. I just love your outfit!! I'll definitely invest this fall for Dewar suede ankle boots, Isabel Marant. I can't stop dreaming about them ahah. i love the cut of that f21 skirt! I live in New Zealand so I'm heading into summer and coming up with a summer wishlist! So far I'd like: Swedish Hasbeens, a classic blue denim shirt, cats eye sunglasses and a couple of knee length dresses. A similar wishlist to you actually! But, brown loafers, chunky blue sweaters, and hunter green jeans. I'm in love with this skirt you've got, its such a lovely shape. like your outfit! Your skirt look so cute! A leather jacket is on my wishlist for so long now so I hope I find a nice one for autunm. I'm also longing for a burgundy jumper or cardigan and the perfect pair of black boots. Well we are just heading into Spring now (yay!) so I am more on the lookout for some yummy Spring dresses and light jackets. 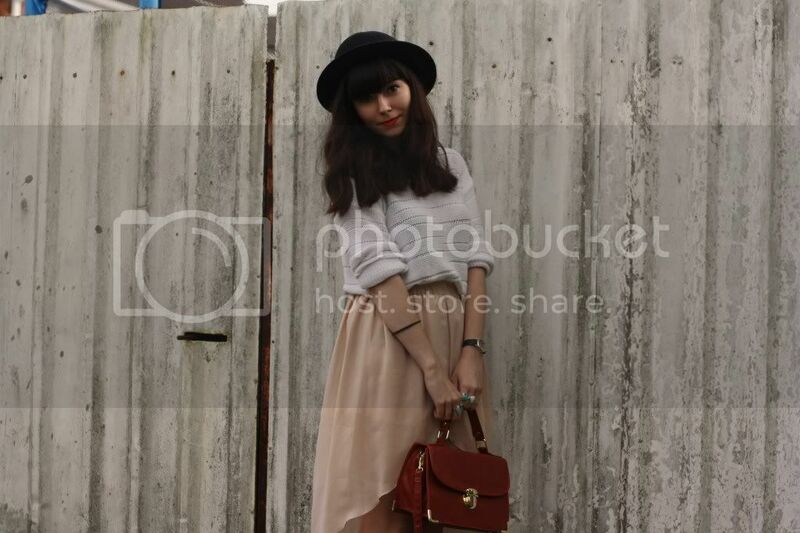 I love your talent for pulling off hats and these awesome sweater-and-skirt-looks! 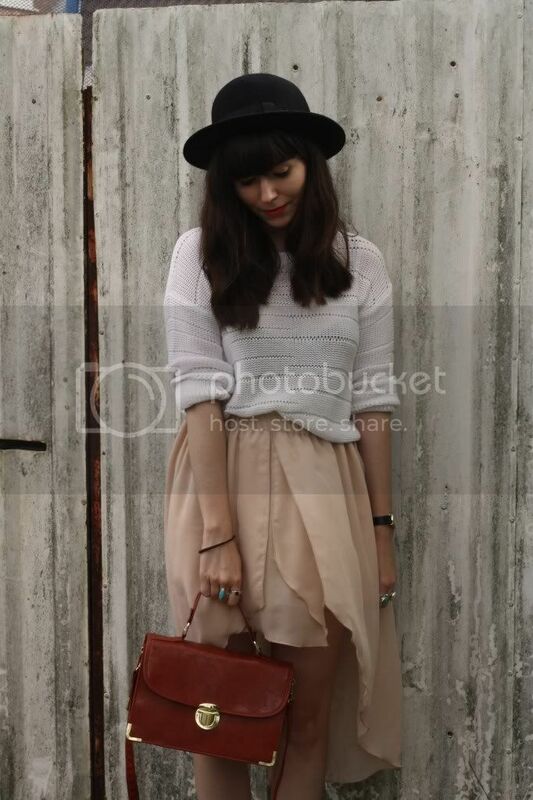 I've just come across your lovely blog - and this outfit is amazing! I'm heading down to Forever 21 tonight, that jumper is gorgeous! !